Looking into getting your first camera, or perhaps a new one to replace your old one? Maybe you’re considering buying a camera for a child or loved one, whether they are a budding photographer or camera enthusiast. Whatever the case, ensuring you get a good quality camera that has everything you need can sometimes be a time-consuming and expensive endeavor. Buying a camera is a commitment, so before you buy one you need to make sure you have all the information you necessary in order to make an informed decision. What is the Canon EOS Rebel T5? Luckily for you, we’re here to provide all the information you could possibly need in your pre-purchase stage, the good and the bad. Continue reading to find out just what we have to say about the Canon EOS Rebel T5, and if this camera will work for you. The Canon EOS Rebel T5 is a compact, DSLR camera. This beginner’s camera is marketed as being for perfect for families. It’s nothing too fancy, so it’s ideal for taking quick shots on a family vacation without having to worry about adjusting settings or getting lost among different features and buttons. As a novice camera, it also makes a ​​​​good option to look into for young shutterbugs just starting to take an interest in photography, and who are in need of only the basics. As a DSLR, the camera is adaptable to interchangeable lenses. While there is a kit lens that comes with the camera, you can a find a multitude of other compatible lenses through Canon. The EOS Rebel T5 is the successor to the EOS Rebel T3, another novice DSLR camera, bringing Canon’s DSLR options up to the imaging standards of the modern world. It’s closely related to the EOS Rebel T5i, which is basically a more advanced cousin that provides additional features. Like most digital cameras available nowadays, the Canon EOS Rebel T5 has an LCD live viewing screen. The screen is a standard 3’’ wide, providing a large and clear image. This is great if you want to be able to see what your image will look like without putting the camera directly up to your face. One of the biggest updates that this camera offers over its successor is the new Full HD Movie mode. The camera captures 1080 p footage, a quality that is fairly standard now among good cameras available. Taking video is very easy using the camera’s automatic and manual controls, and it provides in-camera editing options. The biggest selling point of this camera is its ease of use and just overall user-friendliness. This clearly comes out in its Scene Intelligent Auto mode, which combines a multitude of automatic modes that have to deal with focus, balance, image optimization, and more. The combination results in the overall Scene Intelligent Auto mode, which automatically frames, stabilizes, and accounts for all aspects of your image so that you don’t have to spend time figuring it out yourself. This is part of what makes this camera great for beginners and taking pictures on the go. Further down this line is the EOS Rebel T5’s Feature Guide. The Feature Guide is just what it sounds like—a guide of all the features and functions of the camera. When any feature is selected, a quick description of what exactly it is pops up, so you don’t have to worry about accidentally selecting the wrong mode before taking a picture. If you’re not a fan of the constant information popping up, you can disable it in the settings. In terms of build, this camera is also highly convenient and user-friendly. All the buttons and functions that you need to reach are located conveniently on the right-hand side, so you can easily use this camera one-handed. Its relatively small build and grip features also make it ideal for single-handed use. The Canon EOS Rebel T5 boasts an 18.0 Megapixel CMOS (APS-C) sensor, which offers 6 MP more than the T3 camera of which it is an update. This allows for clearer images to be produced, without the worry of any blurring or distortion when it comes to printing and enlarging. In continuous shooting mode, the camera can capture images at a rate of 3 fps (frames per second). While this is not a very impressive speed, it serves its function for being a novice camera. In terms of autofocus, the camera offers nine focus points that can be selected both manually and automatically. It does not offer depth of field preview options. In terms of shutter speed, the camera has a rate of 1/4000 for up to 30 seconds with a low lag time. It has timer options, ranging from two to ten seconds, so you can get in the shot with everyone else. The camera also comes with a built-in, retractable flash for easy transportation and storage. The camera weights around 480 g, a little on the heavy end for a compact camera, though this does include the weight of the lens. Additionally, this is nearly 15 g lighter than its predecessor, the T3. Its dimensions are approximately 5.10 (W) x 3.93 (H) x 3.07 (D) in. In terms of battery life, the Canon EOS Rebel T5 is pretty stellar. If taking pictures only in viewfinder mode, the battery can last for up to 500 shots, over 200 shots more than many other cameras of a similar nature. If continually using the live view LCD screen, however, it should be noted that the battery life drastically declines to 180 shots. When you find that your battery does die, you can turn to the built-in backup battery. The camera comes with a USB port for easy charging. For the most part, the public seems to love this entry-level DSLR camera. For its price and how it’s marketed, users find themselves pleasantly surprised by the number of features that this camera does have. Novice photographers love it for its user-friendliness and intuitive design, and also praise it for producing great images. One aspect of the camera that has received criticism, however, is its kit lens. Some users feel that the lens is not up to par with the rest of the camera, producing images of lower quality. Instead, they recommend purchasing the camera’s body only, and buying a different Canon lens separately. 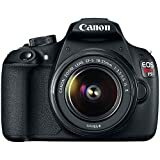 You can find the Canon EOS Rebel T5 for its standard price of $549.99 on the Canon website. If you turn to Amazon, however, you can get this camera for the massively reduced price of $. The camera typically comes with a USB cord, strap, and lens. Now that we’ve taken a close look at the EOS Rebel T5 camera and all it has to offer, how does it stack up against the competition? We’ve directly compared this camera to the Nikon 1 J5 and the Olympus XZ-10, two cameras in the same field and price range, to get an idea. But first, let’s look at some general ratings of this Canon camera to keep in mind as we compare. On the surface, the Nikon 1 J5 and the Canon EOS Rebel T5 are fairly similar. They are both compact cameras, they both have an LCD live view screen, and they both are marketed as entry-level DSLRs. They also both offer high quality 1080 p video. Additionally, both cameras were originally priced around the $500 mark, but have since become available for much lower deals on Amazon. Where the Nikon 1 J5 surpasses the Canon EOS Rebel T5 is primarily in terms of its creative features. The Nikon camera offers multiple “creative modes” for specialized shooting as well as a “cinematic mode” for video, and it has a continuous shooting speed of 20 fps. This lends the Nikon 1 J5 user a wider range of specialty when taking photos and videos. Furthermore, the Nikon camera’s LCD screen is superior to that of the Canon, offering touchscreen and tilting capabilities. Lastly, the Nikon 1 J5 is much smaller and more compact due to its nature as a mirrorless camera, weighing 231 g to the EOS Rebel T5’s 480 g.
The Canon EOS Rebel T5, however, still has an edge over the Nikon 1 J5. In terms of battery life, there is no comparison: 500 shots per charge to the much lower 250 shots of the Nikon. The Canon camera also offers superior continuous focus while shooting videos in addition to superior viewfinding capabilities. Lastly, the Canon’s DSLR nature lends it to be adaptable to interchangeable lenses, providing it with greater range than the Nikon 1 J5. Although the Olympus XZ-10 is a mirrorless compact camera while the Canon EOS Rebel T5 is an entry-level DSLR, the cameras do have a few similarities. Both cameras, for instance, offer a 1080 p HD video resolution. Both cameras also have a 3’’ LCD fixed-type screen. Neither camera offers wireless capabilities. The Olympus XZ-10 has a few key functions that the Canon camera lacks. For instance, this Olympus model offers both a touch screen and image stabilization features. The Olympus also has a port for an attachable hot shoe, lending it greater capabilities in low light and dark environments. It offers 35 focal points to the Canon’s nine, and also has a superior continuous shooting rate of 5 fps. Lastly, the camera weighs only 221 g, over 250 g lighter than the Canon camera. The Canon EOS Rebel T5 still does pull ahead, however, in several key ways. To start, just as with the Nikon 1 J5, the Canon offers a wider range of adaptability due to its interchangeable lenses. It also offers superior max sensor resolution (18 MP vs 12 MP) and shutter speed (1/4000 vs 1/2000). Finally, its battery life is over double that of the Olympus camera: 500 shots per charge compared to the Olympus’ 240 shots. Now that we’ve seen how the Canon EOS Rebel T5 compares to the competition, let’s make a quick recap of the biggest pros and cons that this entry-level DSLR camera has to offer. The biggest pro for this camera is definitely its easy usability and intuitive design. The fact that it can be operated with one hand is awesome. We also like its nifty Feature Guide and automatic modes, which ensure you will take a quality picture every time. Another major pro to this camera is its rockstar battery life. Offering 500 shots per charge and also sporting a backup battery, this has a much longer lifespan than you’ll find among other similar cameras. Now for the cons. The biggest con is probably that there really isn’t much to this camera beyond its essential features. There’s nothing inherently wrong about it, but there’s nothing special, either. It’s a little bulky compared to some other cameras as well. Furthermore, its continuous shooting rate is fairly slow, and it doesn’t offer any wireless capabilities. So, when it comes down to it, the Canon EOS Rebel T5 is a pretty good camera if you’re looking for something that’s simple and you don’t require anything too fancy. There are better cameras out there for a better bargain, but if you purchase the camera for its Amazon price than it’s all in all a pretty good deal. While there’s nothing particularly exciting about this camera, it’ll get the job done and is good for novice photographers and families on the go. The EOS Rebel T5 is easy to use and has an intuitive design. Its the battery can last 500 shots per charge. However, the Rebel T5 has no wireless capabilities.